This post has been generously written by PJ Hoover, author (and Texas Sweetheart!) of the Forgotten Worlds Trilogy, a mythology adventure for middle graders. 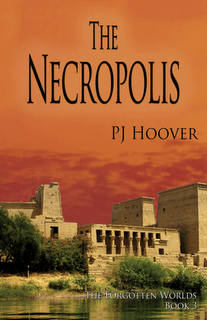 The exciting final book, THE NECROPOLIS is available now from CBAY Books! The situation in Lemuria is rapidly deteriorating. In fact teleportation between the hidden continent and the outside world has become so dangerous, all agents and their families have been recalled. Although Benjamin is psyched to be living in Lemuria full time, he knows he needs to find his last brother soon. However, between classes, a murderous half-brother, and complications with his friend Heidi, Benjamin can barely focus. Besides, there’s only one place left they haven’t searched—the hidden continent of Atlantis. Setting Notes from PJ: When I chose the setting of a secret genetic engineering lab, in no way did I plan to duplicate the efforts already done for “Laboratory”. That list is awesome and comprehensive and a definite go-to for the standard lab. But what sets apart a secret lab? And what about one where secret genetic engineering experiments have been going on? That’s what I’m going to focus on. Retinal scanners, LEDs, test tubes, high tech note-taking equipment of choice (for THE NECROPOLIS, it’s the Thought Cache), secret levels, elevator doors, Bunsen burners, frustrated lab workers, coffee cups scattered around, snack containers, overflowing trash can, mutated creatures in various stages of development, glass specimen jars of all sizes, stainless steel (counters, cabinets), lab coats, labels, rooms with hidden entry. “Are you leading us to Hell?” Benjamin asked as the halls seemed to spiral and loop back on themselves. How did anyone keep their sense of direction down here? Benjamin, Heidi, and Cory gave them the short version. The really short version. It was obvious from Gary’s continued fiddling with the test tubes that he and Aurora had something else on their minds. — Similes and metaphors create strong imagery when used sparingly. Iva sighed. “It’s not that bad, Andy.” She headed back, grabbed his hand, and dragged him through the door. Benjamin laughed because…well…it sounded just like Gary and Aurora. Benjamin felt the truth as sure as he knew he had ten toes. Very well done. It is great to see the mechanics of making writing work. I don’t know why it surprises me but I’m always amazed to know you’re from Calgary. What a great place. I’m going to be there for the winter…brrr. Wow these are great! I felt like I was dropped in an evil lab, waiting for a mad scientist to start experimenting on me. I loved this! The science angle was fun! Great examples. With your science background, I bet it made it easier to design the lab. Thanks for sharing. Thanks so much, everyone, for reading! So great, PJ. This kind of setting would’ve been impossible for Angela or me to provide. Thanks for filling in such an interesting blank! Seriously, even though I don’t know if I’ll ever write a story that has a secret genetic engineering lab, I just LOVED reading this posts!! So great! Thanks PJ! Now I’m off to read the amusement park post again, because my story DOES have one of those! Love this blog! I love the futuristic techi stuff fused into a story that has dangerous characters and an intriguing plot. Your examples of words to create atmosphere are wonderful. These posts are so informative and interesting. Thanks for boosting my muse and provoking some wonderful thought! P.S. This book sounds wonderful, something I’ve added to my TBR list. Ooooo, neat examples! Love the empty eye sockets and jelly beans, ha! Thanks PJ and Angela. Yay! Thanks for letting me hang out on your blog for the day, Angela!